Protesters in the Middle East made history in 2011 when they toppled dictators who had been entrenched for decades. As the world economy worsened and austerity measures hit, the wave of demonstrations spread to Europe and the United States. From Tunisia to Egypt, from Athens to Madrid, from Zuccotti Park to London’s financial district, protesters came out en masse, calling for an end to inequality and for government leaders to be held accountable. Specific demands varied, but one thing was universal: a new conviction that real change could be achieved through the peaceful action of the masses. 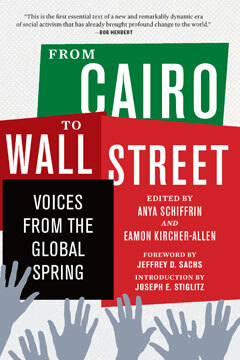 From Cairo to Wall Street is a stirring, on-the-ground account of these protests, in the words of the people who made them happen. Journalists Anya Schiffrin and Eamon Kircher–Allen bring together voices from across the world, many from the front lines, to tell the story of movements that redefined history. We hear from the Egyptian youth leaders who transformed Tahrir Square into a symbol of freedom; we hear from the Indignados who raged against austerity measures in Spain’s already dark times; and we hear of the many Americans, from New York to Madison to Oakland, who marched under the banner “We Are the 99%.” Chapters by Schiffrin, Nobel Prize–winning economist Joseph E. Stiglitz, economist Jeffrey D. Sachs, and columnist Laurie Penny frame these movements in the context of global capitalism and its discontents, drawing connections between the individual protest movements and the singular sense of outrage that has fueled them the world over. World history is marked by pivotal years that have profoundly altered its course: 1789, 1848, 1939, 1968, 2001. Although only time will tell whether 2011 will be such a year, the recent protest movements have undeniably given shape and spirit to a new global community—and From Cairo to Wall Street is its portrait.